3D Printers have been out on the market for some time now, but they’re still considering such a new product that it can be difficult to find any sort of guideline on which aspects you should look for when looking to make a purchase. Certain printers are versatile in different areas, but if you’re looking for one specific function it’s going to be a challenge. In terms of overall printing, we’ve narrowed it down to the Top 5 3D Printers that you won’t be disappointed with. Solace is a high-resolution, stereolithography 3D printer offering a combination of innovation, quality and reliably that most can’t even dream of given its price range. Unlike most 3D Printers, the Solace uses a resin cured by a DLP projector. This light hardens the resin one layer at a time. This allows for x-y resolutions to be formed as small as 25 microns and a z resolution as little as 1 micron with build times that are normally 5 times faster than FDM or 3D laser printers – that’s incredibly fast! We tend to think of the Solace as a car in which you never have to change the oil. Their patent-pending peeling technology eliminates the need for reciting or replacing the resin tanks. This saves up a lot of your time and cash, meaning you’ll more than likely be holding onto this printer for quite a long time. It’s definitely a printer that’s built to last. It’s built from high-quality stainless steel parts and anodized aluminum. On the user-end, it’s meant to be incredibly friendly with software that’s non-restrictive giving you the ability to use almost any photo resin. With such a high-resolution and smooth resolution finish coupled with fast build speeds, this printer is ideal for jewelry, complex design, research, or even in the engineering or medical applications workplace. 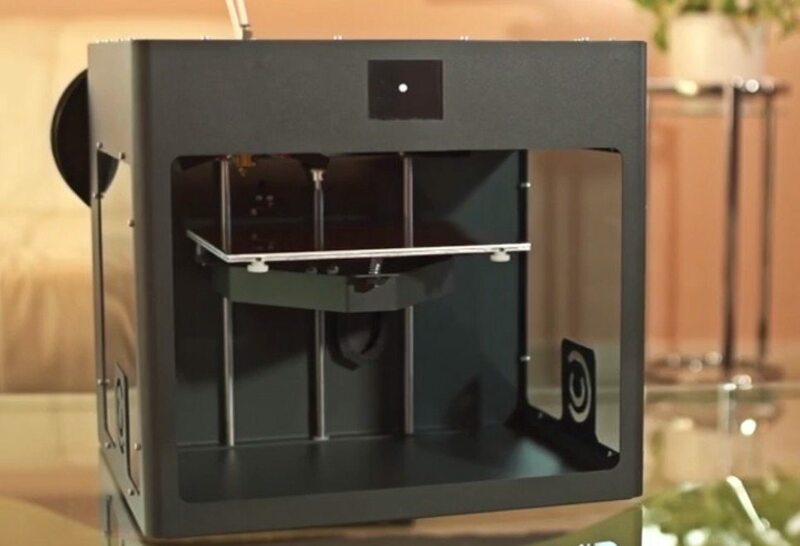 When looking at the Nea, you know that a Desktop 3D printer should be compact, reliable, good-looking and super easy to use immediately after taking it out of the box, hence its creation. With a minimalist design, its architecture is not without cause. Its strength and stability adds to what a conventional printer might do. They know that desktop footprint is crucial, and the Nea footprint to build volume is unmatched. Their philosophy is that if there’s room on the table for a lamp, there’s definitely room for a Nea. Right out of the box, you can print right away with feature-rich software with a free cool-spool filament cartridge so you can being right away. What makes it incredibly flexible is that you can use a wide range of open source software or filament that’s compatible. This will give you the print quality and speed of a much more expensive machine at a reasonable price. Even though it’s such a decent price, it’s made to last and be incredibly smart, not cheap. All of their printers are designed in North American only using high-end electronic components along with reliable hardware. One of my favorite things about the Nea is that it’s modular – you can swap out components that are in the market so you can continuously upgrade with new models that are in the works. Essentially, it’s the best of both worlds: you can upgrade it like a PC but it’s smooth and beautiful like a Mac. Craft Bot realizes that the new 3D printing technology is pretty cool, and that when you look at 3D printers on the market today, there will be a ton of problems. It’s not their original intention to simply make another printer, but rather to take some of the most desirable features already found in current models and coming them into one quality and long-lasting product. Many 3D printers simply can’t make larger, more practical products. The Craft Bot is designed with the fact in mind that they need to accommodate for the largest possible build volume yet still maintain its compactness. Another problem you might find with other printers is that finished prints tend to bend from the plate. With intricate designs, they become unusable. Craft Bot comes with a heated bed platform that makes it easy to remove your products after printing. Yet the best thing about the Craft Bot is that its immediately ready to use right out of the box. It was created by hardware and software developers who have been already been working in the 3D printing industry for over a decade. The printer is made with durable components that incorporate extremely detailed parts that help give a 100-micron resolution to your prints. The Craft Box also allows you to use any 1.75 mm filament, meaning you can save money by selecting the one that best fits your budget. The printer doesn’t let off any harmful fumes either, allowing you to be at ease when printing. As for the software, it can be controlled with the one that comes with it or any open source software. They’ve also developed a slicer that’s one of the most efficient in its class. As of right now the software is only compatible with Windows, but Craft Bot claims that it will support other operating systems in the near future. Stacker is another 3D printer that allows you to print multiple copies of an object at the same time in different colors using different filament – great for mass producing. This makes it at least 4 times faster than other 3D printers, definitely making it one of the fastest in its class. It’s one of the best commercial printers that’s actually affordable and is designed for busy offices, schools or manufacturers. The z-axis can be expanded to print up to 24-inch high objects (just over 600 mm). You can also configure it for both desktop or mobile uses. A large range of filaments can be used, including high-tech alloys that contain carbon fiber, kevlar, ptfe, wood, bronze, copper, bronze and bamboo. The Stacker 3D printer is definitely one of the best and newest 3D printers on the market. Last but not least comes the Rapide Lite. The Rapide Lite 200XL Desktop Plus is one of the newest in its class that comes at a 400mm build height and a build volume of 16,000 cm3. Its large build area allows you to build a complete full-figured human body in just a span of roughly 8 hours. The arm 32-bit control board makes it incredibly easy to use with a 2.8 full color LCD touch screen. It uses X Wing technology to bring only the highest of print qualities and using extreme bridging to create only the best. It has permanent quality control, and it may be at a price that’s a bit more steep than other printers but definitely worth it if you’re looking for something great. It prints at 50 micron resolution, but don’t be fooled by this. It will still print at incredibly fast speeds, another reason why it’s one of the top printers in its class. Complex images and designs are definitely not out of the question when it comes to the Rapide Lite, and if you’re willing to spend a bit more this is definitely the printer for you. 3D printing has come a long way, and as mentioned above it can sometimes be difficult to find a printer that best suits your needs. These 5 printers have done their best in trying to create a device that combines the best qualities of many 3D printers into one. Use these reviews as only a guideline, as we highly suggest that you do your own research and only spend the necessary amount on a printer that best suits you.